So with an election to be called later this year, or early 2019 at the latest, the Liberal Party has opened the John Howard textbook on how to run an election campaign: Fear, Blame & Bribery. The bribery is coming in the way of corporate and personal tax cuts that will be rolled out over the next ten years as announced in their Budget speech on 8 May 2018. 4. Superannuation tax cuts, costing $2.5 billion in 2009-10. 5. Converting 'franking credits' into cash refunds for shareholders, costing $4.6 billion in 2012-13. This is calculated based on the shareholder's tax obligation compared to the tax already by the company who they have shares in. Interestingly, Labor proposed removing this benefit for people who pay no tax, such as pensioners. This would have saved the government $8 billion over five years. Yet, Liberal Party waged another fear campaign and accused Labor of attacking pensioners. Labor's proposal made sense. Why should someone who has no tax obligation get a tax benefit. This is not an attack on pensioners, it is actually providing fairness for all pensioners because those who have no shares do not get this benefit. If the Liberal Party is so concerned about this being an attack on pensioners, they would be better to follow Labor's suggestion and then use the $8 billion saving to increase the pension so all pensioners benefit. Howard is often seen by conservative voters as being economically responsible based on the fact that he left office with net financial assets, i.e. negative debt, after inheriting $96 billion in debt from the previous Labor government when he became prime minister in 1996. Funnily enough, this $96 billion of debt comprised of almost $40 billion that Labor inherited from the previous Liberal Party government in 1983, when John Howard was Treasurer. By 2007, Howard achieved negative debt, not by good fiscal management, but by selling government assets for $72 billion(2) to cover his excessive expenditure. The International Monetary Fund declared the Howard government to be the most profligate government in 50 years. Unfortunately, thanks to right-wing bias and poor economic analysis reported in the media, Howard is hailed as an economic genius. He was an economic moron who blew mining boom and sold off the farm to cover his wasteful spending. A 2008 Treasury report showed that between 2004 and 2007, $334 billion was added to the economy as a result of the mining boom and economic growth. So Howard and Costello, showing questionable economic judgement, spent 94% of it through tax cuts and other concessions. To help cover this, these two economic illiterates then sold off assets for $72 billion. At the time of Howard being ousted, Australia's surplus was just 7.3% of GDP. (3) Australia is now in deficit, and has been for since 2009, hardly warranting the tax cuts proposed by Turnbull and Morrison's 2018 budget. And then the mining boom ended at the same time as the Global Financial Crisis hit. By this point, the Labor Party was in power. Thank God, Prime Minister Kevin Rudd and Treasurer Wayne Swan had the foresight to implement stimulus spending. Why did they do this? Well, the economic illiteracy of the Liberal Party called the stimulus reckless. However, it is basic economics. Because of the disastrous economic outlook with advanced economies across the globe diving into recession, businesses stopped spending and consumers stopped spending. Clearly the two have a bidirectional relationship. Without consumer spending, businesses lose money so stop investing and start axing jobs. With less investment and increased job losses, consumers tighten their belts even more. It would have been disastrous had the government also stopped spending. The economy would have ground to a halt and nose-dived into recession. Rudd and Swan inherited little savings from Howard and Costello; there was little money left from the mining boom at a time when government spending was required to stimulate the economy. So they spent anyway. This was sound economic behaviour. It saved jobs, businesses and prevented Australia going into recession. One of the only developed nations that survived the GFC without recession. Of course, the Libs made much of Australia operating a deficit, however, deficits indicate economic stimulus because of government spending, which creates jobs and helps the economy grow. Surpluses, which the Libs seem to think is some sort of economic nirvana to be aimed for, indicate austerity, which costs jobs and slows the economy. There is a time for surplus and a time for deficit. The GFC was the time for deficit. Besides, if the Libs were so concerned about the deficit, they should have saved the mining boom revenue rather than blowing it like the prodigal son getting hold of his inheritance. The Turnbull and Morrison budget for 2018-19 contains massive errors in judgement similar to Howard and Costello. At a time when there is economic growth, the government should be banking savings and paying down debt. Instead they are going to implement long-term structural tax changes based on short-term revenue improvements, which will commit future governments to unnecessary expenditure. The Liberal Party claims that the budget is on track to deliver a surplus of $2.2 billion by 2019-20, and $11 billion by 2020-21(4). Meanwhile, Australia's current net debt is double what it was under Labor in 2013, when the Liberal Party took over government. The Liberal Party is claiming that the money they are saving is coming from increased revenue. They are making the same mistake that Howard did. Howard based his extravagant expenditure on the revenue from the mining boom. We all know how that ended. The mining boom went bust and Australia was stuck with structural expenditure changes in the way of tax cuts, superannuation benefits and family payments. Yet where is the outrage over government debt? Where is the outrage that was reported on daily in the media during the Labor years following the GFC. If there was any doubt over right-wing bias in the media it surely is this lack of outrage in the Murdoch papers over doubling of the debt by the Liberal Party and its profligate 2018-19 budget. 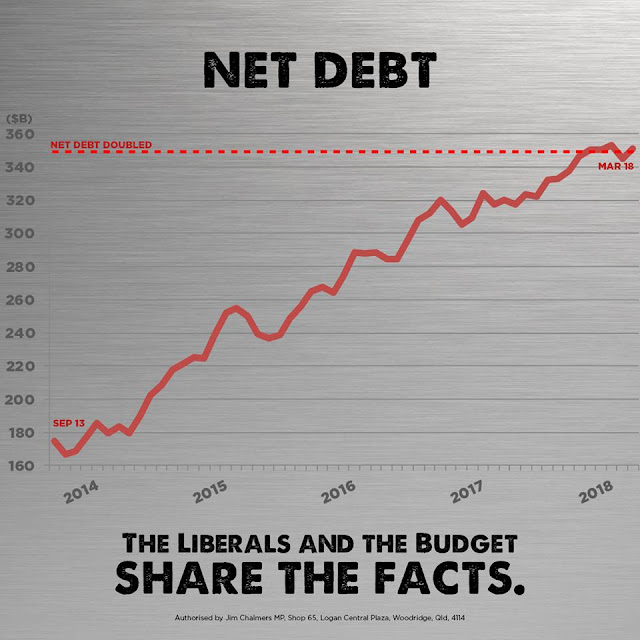 During Labor's term, the Liberal Party rabbited on about debt and deficit being out of control. Yet here we are: debt double what it was under Labor, and Morrison spruiking that the economy is so good that we can just lock in tax reform and spend like drunken sailors based on temporary revenue increases and at a point in the economic cycle when stimulus is less required than it was during the GFC. Morrison's idea that the economy is growing is based on temporary gains driven by commodity prices and job creation caused by a temporary improvement in Australia's Balance of Trade data (i.e. value of imports versus exports). In March 2018, Australia recorded a trade surplus. That is we exported more than we imported. To show how volatile this is, Australia recorded a trade deficit only a few months prior, and a number of previous surpluses a fraction of what it currently is(5). The recent trade surplus has resulted in a forecasted $7 billion in additional corporate tax revenue for 2017-18 and another $7.2 billion in 2018-19(6). However, the Balance of Trade is driven by external factors that the government does not control, namely international economic behaviour, demand for Australian exports and commodity prices. This means that the government cannot rely on these increased corporate tax revenues to lock in structural tax cuts. International economic conditions can change overnight. Morrison has stated that tax will be no more than 23.9% of GDP. This does not allow for government expenditure, it merely locks in revenue to this magical number and anything above that is returned to the tax-payer. As GDP can be affected by commodity prices, is Morrison suggesting that tax will bob up and down like a rubber ducky in a bath-tub every time there is a change in GDP? And subsequently, will expenditure also bounce around like a duck in a mud puddle. Everyone loves to have more money in their pockets and given the stagnation of Australian wages, Morrison admits that the tax cuts are to compensate for flat wages growth(7). Of course, he could have helped thousands of Australian wages by maintaining Sunday penalty rates. The budget does include investment in infrastructure. While there is some criticism of the projects being targeted, infrastructure investment is necessary given Australia's growing population. Morrison believes the tax cuts will help stimulate the economy, however, as this will lock in government commitment to years of expenditure, it would be better for expenditure to be in projects that create jobs. For instance, unemployment in Queensland, Victoria and New South Wales is still sitting between four and 6 per cent despite improvements in employment. Meanwhile, Tasmania, South Australia and Western Australia continue to experience unemployment rates of six per cent and above. Stage 1 - workers earning between $20,200 and $125,000 to receive temporary benefits of between $200 and $530 per annum through the Low Income Tax Offset (LITO). Stage 2 - In 2018-19, increase the 32.5% tax bracket from $87,500 to $90,000, and then to $120,000. In 2022-23, the LITO payments from Stage 1 will end. Stage 3 - In 2024-25, the 32.5% tax bracket is lifted to $200,000, with the 37% bracket removed altogether. The government is marketing this as a benefit for low and middle-income earners, however, by 2027-28, a worker earning $120,000 per annum will have an average tax rate of 29%, which is what they pay today. Meanwhile, a tax-payer on $36,000 will see their average tax rate rise from 10% to 16%(8). Corporate tax cuts will cost $65 billion and Morrison is relying on the naivete of voters when he claims that this money will trickle down in the form of wages growth. However, even Treasury officials admit corporate tax cuts will add less than one per cent to wages. In other words, only $750 per annum based on the average annual wage(9). This budget is nothing more than pork-barreling, wishful thinking, subterfuge and crystal ball predictions in which its real tax impacts won't kick in for at least two electoral cycles. It is a budget with promises that extend ten years into the future while being heavily reliant on a cash boost that has occurred only in the last few months and is unlikely to continue into the long-term. It uses the same failed old policies of conservative governments of yore. Trickle-down economics has worked nowhere in the world. Howard's flagrant spending nearly ruined the economy when the GFC hit, and Turnbull and Morrison have made the same mistake again. Immediately following the release of Budget 2018, ratings agency Standards & Poor released its economic outlook for Australia. While it stated that Australia currently retains its AAA credit rating, it stated that 'risks to the government's plan for an earlier return to budget surpluses are significant. The outlook on the long-term Australian sovereign ratings remains negative for now to reflect these uncertainties'(10). While the Liberals paint themselves as mature and responsible economic managers, Treasurer Scott Morrison resorted to childish, churlish, puerile insults that made fun of Bill Shorten's name. Yep, good ol' school-yard teasing from the party that portrays itself as the 'grown-ups'. The best that Morrison could come up with was 'unbelieva-Bill'. He even repeated it four times case people didn't notice how clever his play on Bill's name was. It's not a very intelligent insult. Perhaps Morrison should take some tips off former Labor Prime Minister Paul Keating, who really knew how to throw an insult. Who can forget Keating's colourful description of Liberal Treasurer Peter Costello as being 'all tip, no iceberg'. (Costello, by the by, was Howard's Treasurer and architect of the structural tax changes that greatly contributed to the current deficit). Speaking of Howard, another of Keating's witty insults declared of Howard, 'the little desiccated coconut's under pressure'. But my personal favourite was his description of former Liberal leader, John Hewson, who Keating stated, '... is simply a shiver looking for a spine to run up'. Morrison's pathetic little insult was in relation to Bill Shorten's Budget Reply speech. Shorten promised that Labor would double the LITO to $928 per annum for people earning less than $120,000, while increasing expenditure to education and health. Morrison went on the attack saying that Labor was spending double what the Libs were so therefore Labor couldn't afford it. Morrison clearly doesn't comprehend the big picture. Shorten wasn't doubling Liberal expenditure. He mentioned that Labor would cap the reduced corporate tax to businesses earning less than $2 million, unlike Liberal's providing it to all businesses. Additionally, Labor is going to reform Capital Gains Tax, tax minimisation through family trusts, negative gearing and franked credits imputations, all of which would save around $80 billion. Shorten has offered one of the most progressive tax reforms in decades. It is vastly superior to that of the Liberal government's budget, which favours the rich and is built on the shifting sands of international economic fluctuations. Australians have a choice between Labor's intelligent tax reform based on economic competency with a history of successfully navigating global economic collapses or the Liberal Party's economic fairy dust based on wishful thinking that the global economy will continue improving and demanding Australian products. What happens to the Liberal Party's budget forecasts when international demand decreases? At least Budget 2018 provides increased funding for school chaplains ... if Morrison's budget gets up, it will need all the wings and prayers it can get! 1. The Guardian, Richard Denniss, 15 April 2015, Peter Costello's five most 'profligate' decisions as treasurer cost the budget $56bn a year, https://www.theguardian.com/commentisfree/2015/apr/15/peter-costellos-five-most-profligate-decisions-as-treasurer-cost-the-budget-56bn-a-year. Accessed 8 May 2018. 2. Market Economics, 25 June 2012, More facts Behind the Howard Government's Debt Elimination. http://www.marketeconomics.com.au/2095-more-facts-behind-the-howard-governments-debt-elimination. Accessed 7 May 2018. 3. The Independent, Alan Austin, 3 September 2013, We really must talk about the Howard and Costello economic disaster, https://independentaustralia.net/politics/politics-display/we-really-must-talk-about-the-howard-and-costello-economic-disaster,5686. Accessed 8 May 2018. 4. ABC, Louise Yaxley, 8 May 2018, Budget 2018: Morrison gives tax system a shake-up in pre-election plan aimed at low-income earners. http://www.abc.net.au/news/2018-05-08/budget-2018-unveiled-by-scott-morrison/9703460. Accessed 8 May 2018. 5. Trading Economics, Australia Balance of Trade (March 2018), https://tradingeconomics.com/australia/balance-of-trade. Accessed 7 May 2018. 6. The Guardian, Gareth Hutchins, 30 April 2018, Federal budget $7bn better than forecast as 'rivers of gold' flow, Deloitte predicts, https://www.theguardian.com/australia-news/2018/apr/30/federal-budget-7bn-better-than-forecast-as-rivers-of-gold-flow-deloitte-predicts. Accessed 7 May 2018. 7. Australian Financial Review, Phillip Coorey & Jacob Greber, 4 May 2018, Tax cuts to compensate for flat wages growth: Scott Morrison, http://www.afr.com/news/tax-cuts-to-compensate-for-flat-wages-growth-scott-morrison-20180503-h0zmfr. Accessed 7 May 2018. 8. ABC News, John Daley and Danielle Wood, 11 May 2018, The Coalition's tax plan favours the rich and doesn't solve bracket creep for middle-income earners, http://www.abc.net.au/news/2018-05-11/the-coalitions-tax-plan-favours-the-rich/9748796. Accessed 12 May 2018. 9. The Guardian, Gareth Hutchins, 28 February 2018, Company tax cuts would boost wages by just $750 over time - Treasury secretary, https://www.theguardian.com/australia-news/2018/feb/28/company-tax-cuts-would-boost-wages-by-just-750-over-time-treasury-secretary. Accessed 8 May 2018. 10. Business Insider Australia, David Scutt, 8 May 2018, Standards and Poor's still has a negative outlook on Australia's AAA credit rating', https://www.businessinsider.com.au/standard-and-poors-australia-aaa-credit-rating-federal-budget-2018-5. Accessed 12 May 2018. 11. ABC Radio National, Breakfast, Fran Kelly, 9 May 2018, Budget tax cuts a 'long-term' plan, Turnbull says, http://www.abc.net.au/radionational/programs/breakfast/budget-tax-cuts-a-long-term-plan-turnbull-says/9741856. Accessed 9 May 2018.